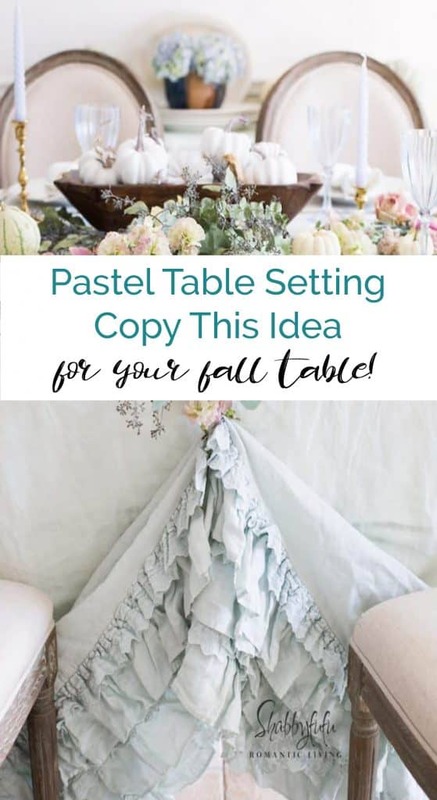 Pastel table setting ideas and tips for fall or any season using unexpected elements to create a softly beautiful table. A duvet cover in the palest of blues from Shabby Chic Couture that I love so much that I have it in white as well. A trick to make any duvet or sheet work as a tablecloth is to pin it in the center on both of the long ends. Duvets are often wide, especially if they are from a king sized bed…so this will keep it off the floor. I used a couple of safety pins and then wove some flowers through the pins to cover them. 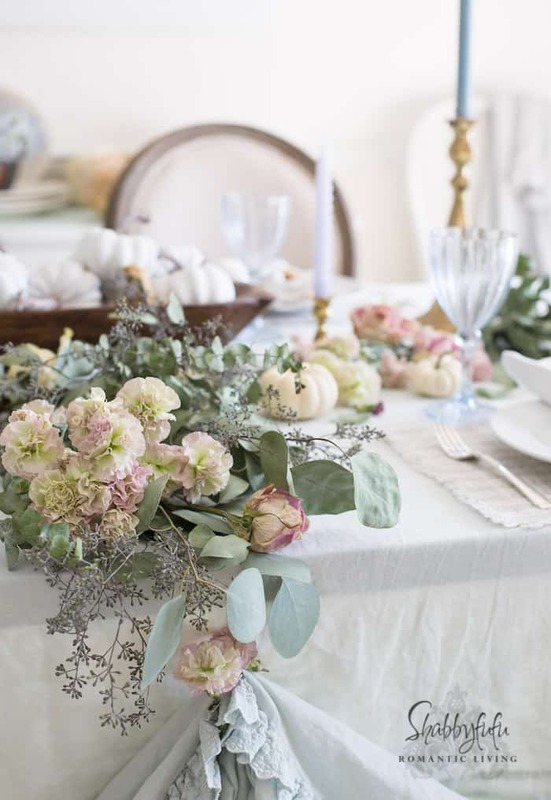 The way that I start out is always by finding flowers and taking it from there to form a tablescape. 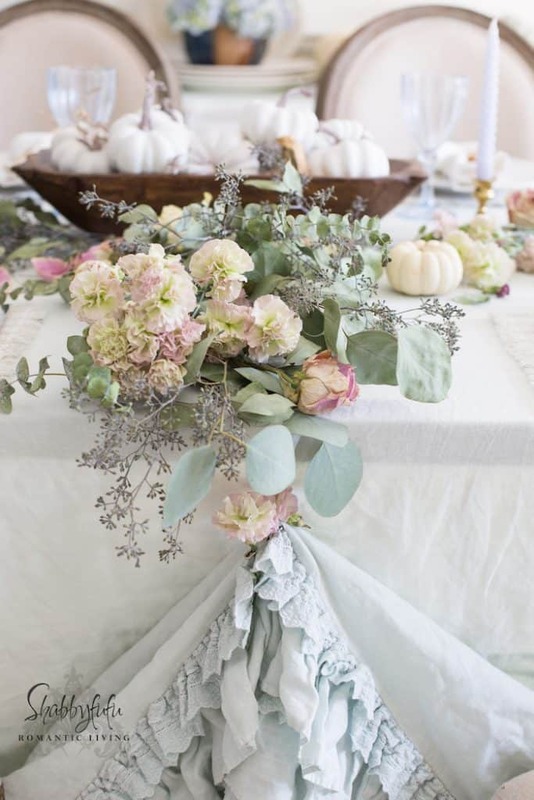 I think that floral arrangements can make or break a table setting. 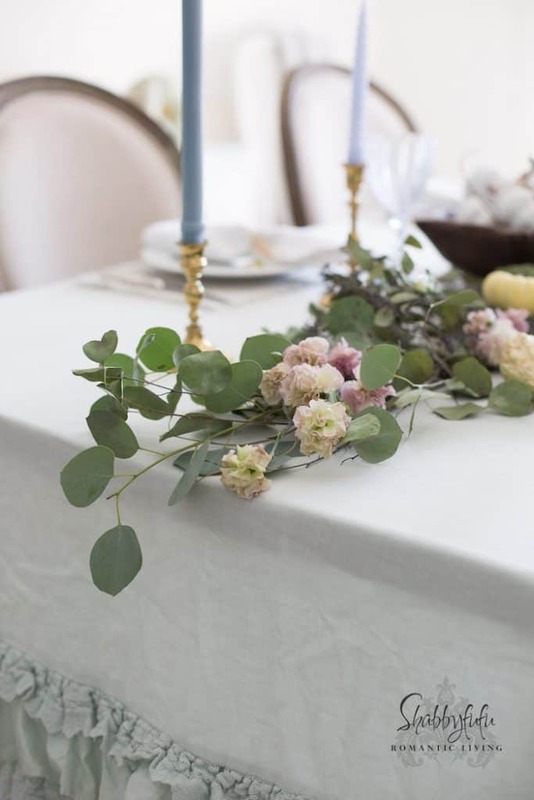 In designing this pastel table setting I wanted to make a table garland, so I took some handfuls of eucalyptus and spread them across the middle. The next step was adding in dried flower, and my supply at hand consisted of fluffy blush spray roses and carnations. Somewhat commonplace, carnations can be found at just about every grocery store and/or drug store. Don’t poo-poo carnations. 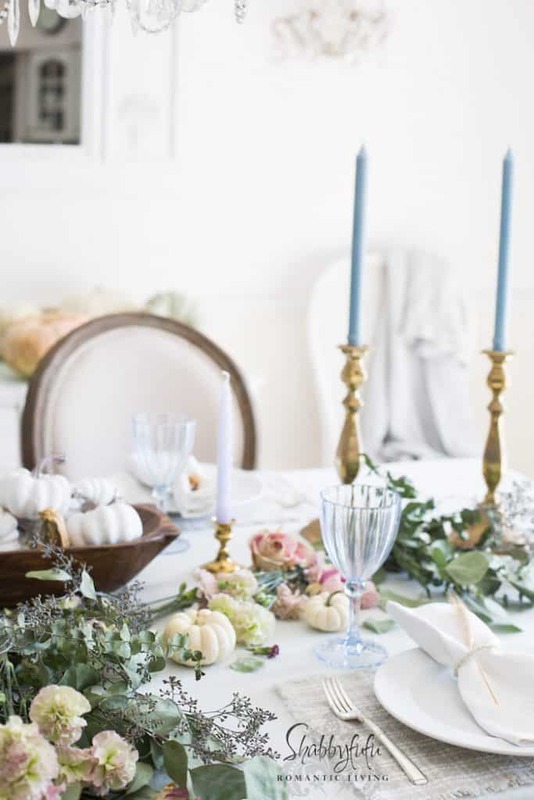 They really can be lovely and fit in with elegant table settings from every day to wedding events. 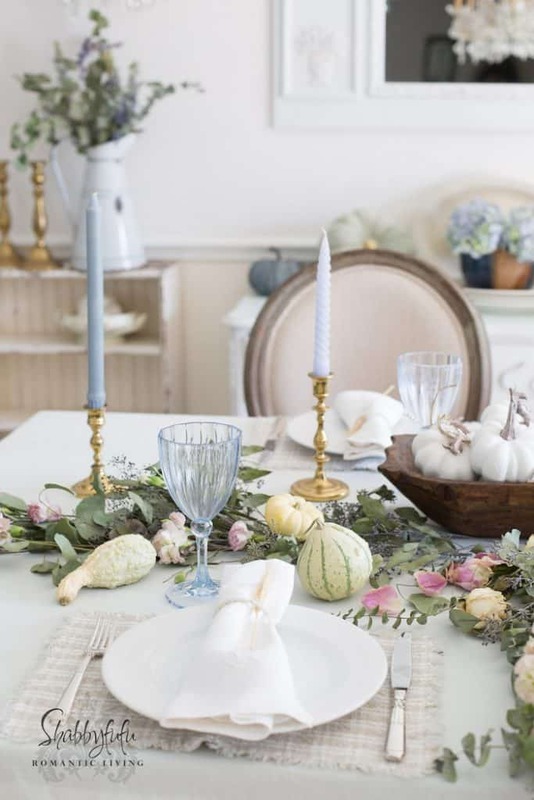 In this pastel table setting they add a pop of soft color. 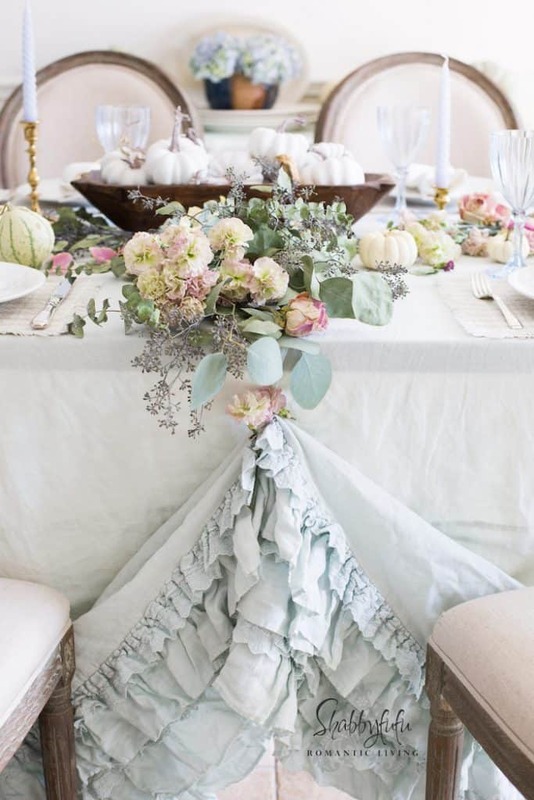 Drape your table garland all the way to the end of the table and then over the edges. If you can bend it slightly to follow the lines of the table then all the prettier. My table is rather rustic and for this look I wanted the style of shabby chic furniture, so covering it gave me that look without changing the table out or painting it. 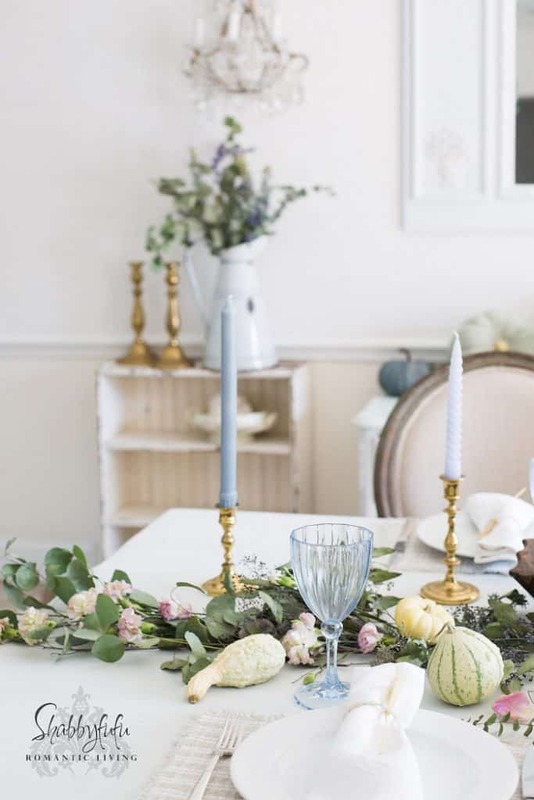 I used placemats that are somewhat rustic because although I didn’t want the table top to be shown, I did want to juxtapose soft and pretty with some farmhouse looks. The placemats were actually gifts when we got married…and they still look great and the neutral tone will never go out of date! The plates are a simple white and are our everyday dishes. I don’t really remember there being such a great selection of gourds in soft greens before this year and I’m loving how they look! Vintage brass candleholders with vintage wedgewood blue candles. 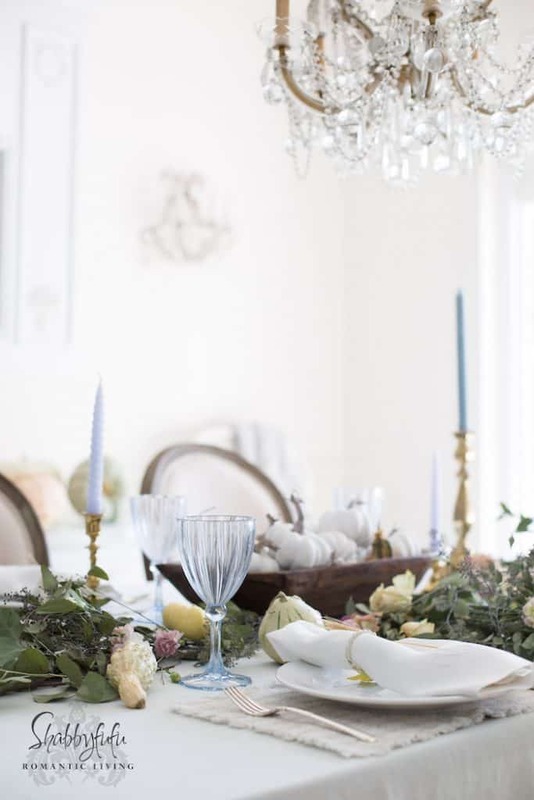 My favorite tabletop accessories in my decor are always the vintage collections that I’ve sourced over the years! 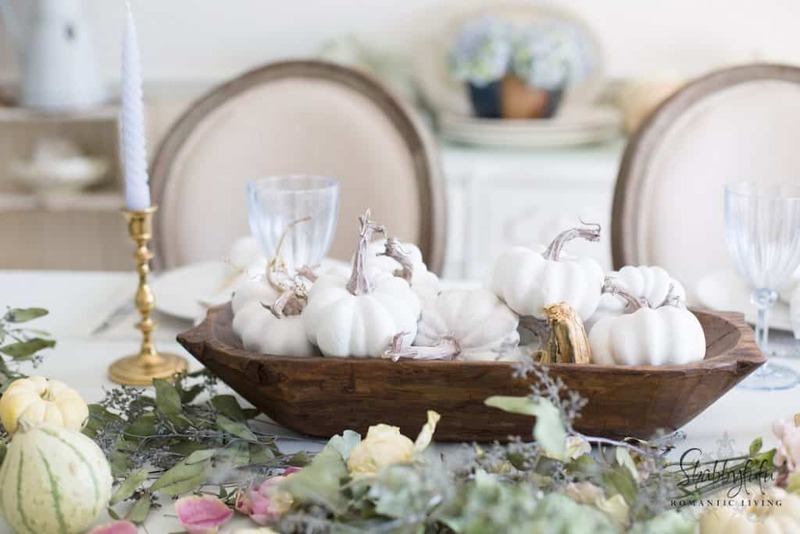 At the center of the table is a vintage dough bowl filled with white baby boo pumpkins that are faux and painted with white chalky paint. It’s a low centerpiece, much like the VEGETABLE CENTERPIECE, so allows for easy convo to flow. So Beautiful 🌷where did you purchase the goblets please? Thank you Cathy! I have had them for several years and I think they were from HomeGoods. Enjoy your week! Oh Holly…thank you so much for that and I hope that you have a fabulous week! Judy, I have to admit to doing Halloween when my daughters were small, but since they are grown I gravitate to pastels. My husband grew up in Zurich. Did you see my post about our recent trip? The Duvet pinned up with the ruffle is like showing a “little leg”. It is so eye catching. Love it. Painting the pumpkins would have never thought of it. All great ideas and Love Pastels. Thank you Frances and it kind of looks like a petticoat I think! Thank you for your help in helping me see all colors and pallets ARE possible when you choose to color your home in the loveliest of romantic colors. PS. Could you help me with question, please? 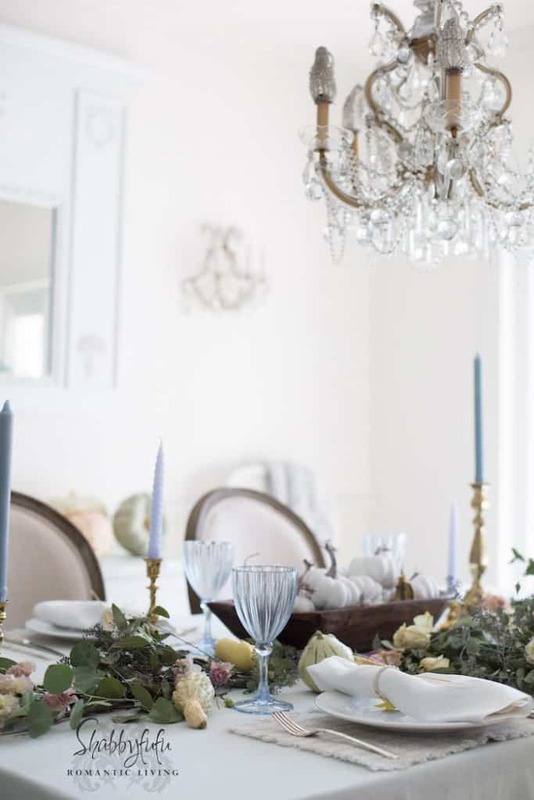 How do you start or find inspiration for the season you decorate? I would LOVE to know your secret sage advice on how to begin! What a thoughtful comment and I thank you! I really don’t look at trends and mostly take my inspiration from nature. For tablescapes I start with flowers and then take it from there. Lots of blog posts for each season…just hover over SEASONAL.